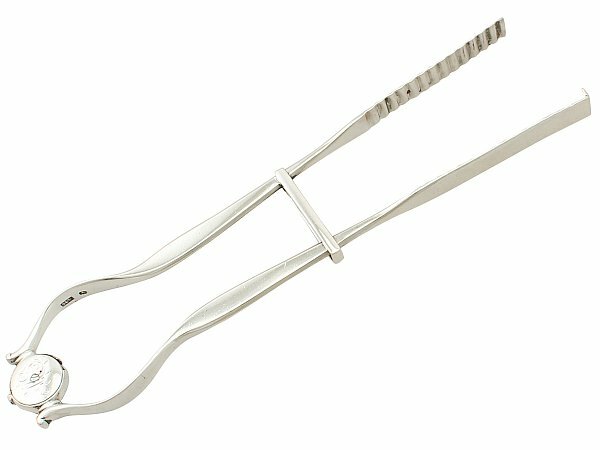 These exceptional antique George III sterling silver asparagus tongs have a plain scrolling undulating form. The surface of the tongs are plain and embellished with the contemporary engraved initials 'ME' to the bridge. The reverse surface of the circular bridge features the functional screw fitting. The elongated blades of the tongs have an undulating surface to the interior. The pinching action of the tongs is guided by a plain rectangular support to the stems. Early period examples such as this are becoming increasingly difficult to locate. These antique sterling silver tongs are a very good gauge of silver, exceptional quality and in excellent condition, in keeping with age.